Downdraft booths work with gravity, while a one-coat lacquer greatly reduces need for sanding and rubbing. The southern Indiana area near the towns of Jasper and Huntingburg is a center for office furniture production. Competition there is hot. To help his company improve quality to better compete, Hank Menke, president and CEO of OFS, decided on a total restructuring of the company’s finish process. The restructure added downdraft booths to ensure greater cleanliness and a custom-designed one-coat finish that greatly improved both quality and production efficiency. As a result of these and other achievements, OFS was recently awarded the Governor’s Award for Excellence in Pollution Prevention. OFS, in its 62nd year, has been manufacturing office furniture for 17 of those years, says Menke. The firm’s 1,100 workers handle numerous SKUs of a full line of furniture in seven plants, all based in Huntingburg, IN. 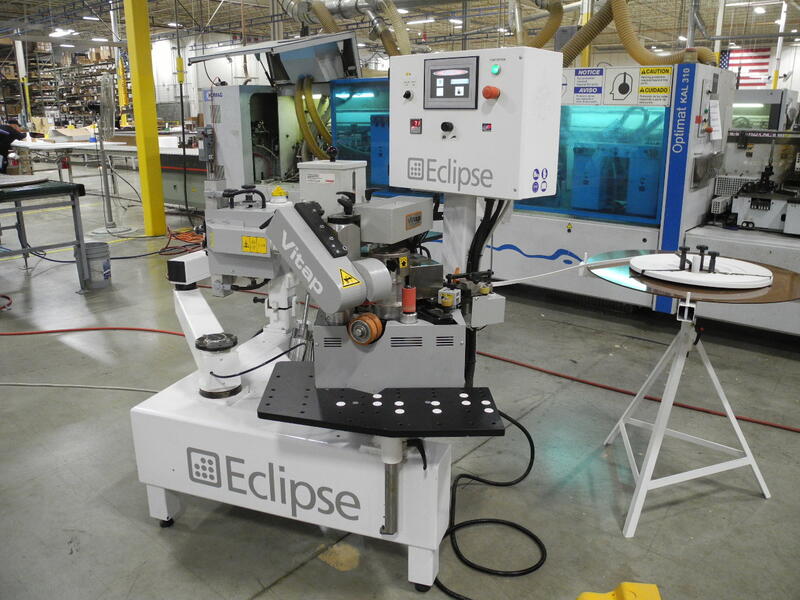 The modular mid-range products are all cut to order, so they can be customized to meet customer specifications. Above: Approximately 80 percent of the OFS product line is finished with a single coat of hybrid catalyzed lacquer topcoated with a high solids sealer. Photo courtesy The Sherwin-Williams Co. The firm has a good track record, but in the face of increasing competition, resting on its laurels was not enough. Aware of that, OFS decided on a variety of moves that would enhance product quality while bolstering production. Quality was enhanced, partly by minimizing the dust in the finish environment through improved housekeeping efforts. But even more important was OFS’ major investment in nine downdraft spray booths. These booths, custom created for OFS by Air Filtration Inc. in California, were adapted from those used by the automotive industry. The new downdraft booths funnel air from the top and exhaust it out the bottom, thus using the force of gravity to improve the collection of dust that results from the finishing process. At a few of the OFS plants, a second booth is positioned off the line. This allows 112-inch-long credenza tops to be sent through production without holding up smaller components in the production system that use the on-line booths. OFS also reduced dust by moving to an innovative system of one-coat lacquer, eliminating one sanding step in the production process. The hybrid catalyzed lacquer, used at OFS as a single-coat product for the first time, was developed by The Sherwin-Williams Co. Custom manufactured for OFS, it does away with the need for one sanding step and a second topcoat. The lacquer’s performance and appearance are augmented with a high-solids sealer in the same product line. The system was chosen by OFS with help from Sherwin-Williams field technical service and sales representatives Richard Loomis and Joe Koza. According to Art Kirby, Sherwin-Williams laboratory director in Greensboro, NC, who helped develop the system, the high-solids topcoat provides a high build and offers excellent filling properties as well as a clear appearance. Some 80 percent of the OFS product line now uses the hybrid catalyzed high-solids lacquer system. Because the lacquer gives the required performance in one coat, OFS saves on the labor and materials cost of a second coat. According to Louie Verkamp, supervisor of OFS’ Plant Five, eliminating the second coat and dispensing with one pre-sanding requirement reduced the need for four workers on the line: one to spray the second coat, and three to rub out the finish. After the topcoat is applied, products are sent through a high-velocity convection oven from that cures the high-solids finish. A timer-controlled infrared oven keeps each piece at temperatures from 150F to 160F for six minutes to harden the finish. Eliminating one rubbing step helps OFS’ finish to maintain hardness under heavy use, says OFS President and CEO Hank Menke. Photo courtesy The Sherwin-Williams Co. This one-coat finish, which Menke calls an off-the-gun finish, reduces the variability of the end product and gives OFS more control over quality. In addition, the high-solids system works well with OFS’ just-in-time practice of sending products straight to customers with no warehousing, saving costs and giving customers faster service. 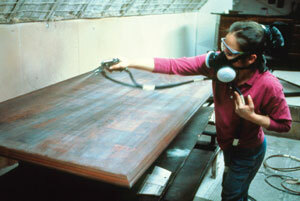 In addition, say both Menke and Verkamp, the one-coat process keeps furniture looking good even after delivery. Because rubbing softens the finished lacquer, it causes the product finish to lose durability, a major problem in the office furniture industry, where products see heavy daily use. “A good finish is extremely critical to office furniture,” Menke says. 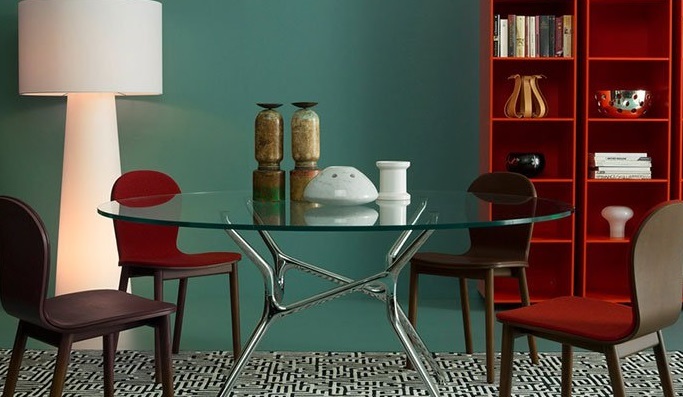 “These products get hard use eight to 10 hours a day.” The catalyzed hybrid lacquer’s elimination of the rubbing process allows OFS to preserve lacquer hardness and ship a tougher piece of furniture. The use of the one-coat product offers OFS other benefits as well. Because it reduces the overall lacquer volume, it affords a 50 percent reduction in VOC emissions. The single coat of lacquer is also in compliance with HAPS regulations and greatly reduces formaldehyde emissions. The entire reconfiguration of the plants, with the change of finish and equipment, took about two years and was completed in early 2000. “We’ve saved quite a bit of money with our new set-up, and we have a better looking product, too, “ Menke says. And it shows. 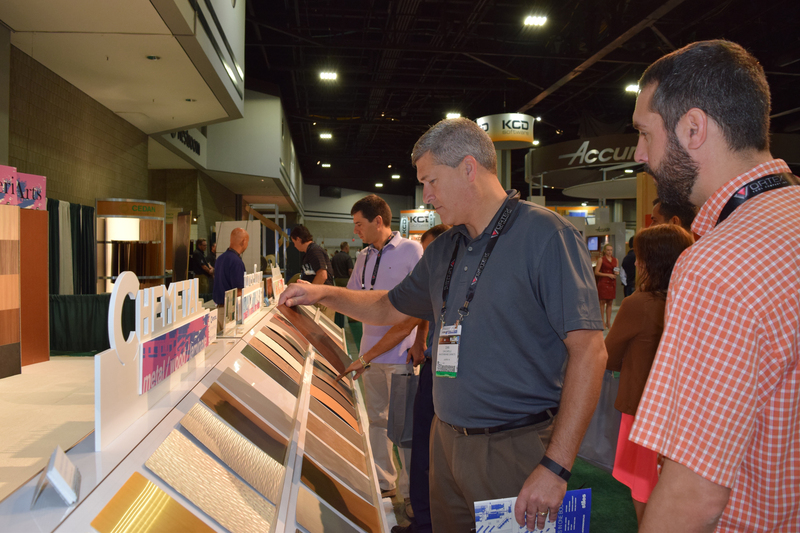 OFS is enjoying what Menke terms “phenomenal growth,” with double-digit sales increases yearly. The key, he says, is to “exceed customer expectations.” OFS’ line improvements, with the downdraft booths and one-coat finish, are giving it the means to do just that.